Arshadi, N. (2014). The mediating role of work motivation in the relationship between emotional exhaustion and job performance based on Conservation of Resources model. International Journal of Behavioral Sciences, 7(4), 337-345. Nasrin Arshadi. "The mediating role of work motivation in the relationship between emotional exhaustion and job performance based on Conservation of Resources model". 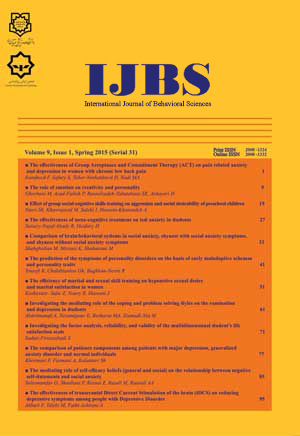 International Journal of Behavioral Sciences, 7, 4, 2014, 337-345. Arshadi, N. (2014). 'The mediating role of work motivation in the relationship between emotional exhaustion and job performance based on Conservation of Resources model', International Journal of Behavioral Sciences, 7(4), pp. 337-345. Arshadi, N. The mediating role of work motivation in the relationship between emotional exhaustion and job performance based on Conservation of Resources model. International Journal of Behavioral Sciences, 2014; 7(4): 337-345. Introduction: The purpose of this study was to investigate influence of work motivation as a mediator on the relationship between emotional exhaustion and job performance based on COR model.Method: The participants of this study included 317 employees of National Iranian South Oil Company (NISOC) in Ahvaz, Iran, who were selected by stratified random sampling method. The instruments used in the study consisted of Maslach Burnout Inventory (MBI), Motivational Orientation Inventory (MOI), and Job Performance Scale (JPS). Structural equation modeling (SEM) through AMOS-18 and SPSS-19 software packages were used to test fitness of the model. In addition, bootstrap procedure was applied for the test of mediation effects.Results: Findings indicated that the proposed model fitted the data properly. The results also supported the direct relationship of emotional exhaustion and indirect relationship of this variable with different kinds of job performance (task performance and organizational citizenship behaviors) by the mediation of work motivation.Conclusion: According to COR model, employees focus on OCB-I to develop support from coworkers and friends in order to cope with burnout.